Today a colleague asked me how best to insert newlines into a concatenated set of address lines within a map. It struck me that despite spending eleven years as a BizTalk developer, creating hundreds if not thousands of maps, and even authoring a Pluralsight course on the Mapper, I’ve never actually attempted something as simple as inserting a newline into a string output! 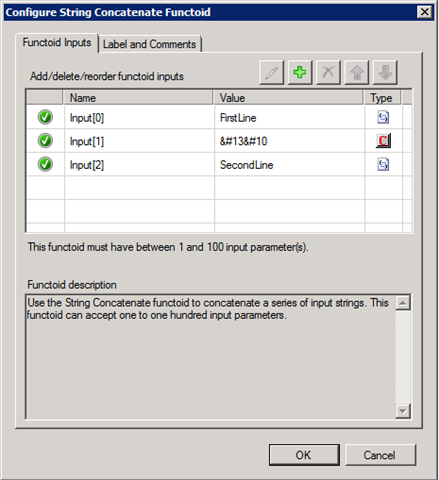 Like most programmers with C# .NET experience, the first instinct was to try inserting “\n” or “\r\n” into the string. But of course that wouldn’t work – the output of a non-scripted mapper link is XSLT, not .NET code. Hmmm… not turning out to be as easy as we thought. Surely we don’t need to resort to inline XSLT just to insert a newline into text? This answer by an MVP on MSDN suggests using a bit of C# script to insert the non-printable characters. That certainly works, since strings within a script block are interpreted in the context of the script language (i.e. a “\n” is correctly translated into a newline). In fact, that would probably be the best option if you had multiple newlines to embed within a single concatenated string. Is this better than using an inline script? Depends on your circumstances I guess. Some developers prefer to have the visual story of the map evident within the mapper grid rather than hiding functionality within a scripting functoid. I suppose a good argument for the script is that in some cases you’d need multiple instances of the character functoid pairs as inputs, since a single parameter can only be used once within a functoid configuration. At least one thing is for sure… after all these years, I’ve finally found a use for a conversion functoid!